We are happy to announce that Friends of Katahdin Woods and Waters and Elliotsville Plantation, Inc. are teaming up to bring back the Head North Ski Days! A Katahdin region tradition in its fifth year, Head North Ski Days is a gathering of nordic skiers taking place between March 17th and March 25th. Join us for free XC skiing at the North/Matagamon Gate as the calendar turns from Winter to Spring at Katahdin Woods and Waters. Starting each day at 10 AM from Saturday, March 17th to Sunday, March 25th, you’re invited to enjoy the beautiful trails beyond KWW’s north entrance. We welcome students, families, outdoor groups, and more. Free skis, boots, and poles will be provided by the Outdoor Sport Institute. Trails will be groomed, and beginner terrain will be available. Volunteers will be standing by to get you, your group, or your family trained up and ready to hit the trails. We recommend you wear warm layers, and pack yourself water, lunch, sunglasses, and sunscreen. For families visiting on Saturday and Sunday March 17th-18th and March 24th-25th, we will be serving fireside marshmallows and hot chocolate. For more info and reservations, contact Susan Adams, Recreation Manager for Elliotsville Plantation, at lunksoos@gmail.com or (207) 852 – 1291. Visit the National Park Service’s Katahdin Woods and Waters Directions page for directions to the North/Matagamon entrance. For a preview of the trails, check out the KWWNM Cross Country Ski Map. And if you’d like to check in on trail conditions, visit the Katahdin Woods and Waters Facebook. Stars Over Katahdin (SOK) is a very special October event that has been sponsored for the past four years by Elliotsville Plantation, Incorporated (EPI), on and around the lands EPI originally owned. When EPI gifted these lands to the United States, the acreage was then decreed by President Obama to be the new Katahdin Woods and Waters National Monument (KWWNM). This year, the Friends of Katahdin Woods and Waters is delighted to continue sponsoring this magical event, with community educational programming during the week of October 1-8, 2018. Each year the event has grown. At SOK 2017, light readings were taken to show that our location for the star viewing event is one of the darkest found in the state of Maine, and maybe even in New England. Stars Over Katahdin has evolved into a successful communities outreach program as well, bringing the Northern Star Planetarium to schools in the Katahdin Region in the same week, along with a small group of Astro VIPs (Volunteers in Parks) that are shared with Acadia National Park. Last year, the Katahdin Woods and Waters National Monument engaged its first Place Based Learning Educator into the Stars Over Katahdin programming. The Monument VIPs offered guided interpretation and hikes or bike rides into the Monument through the weekend as well. 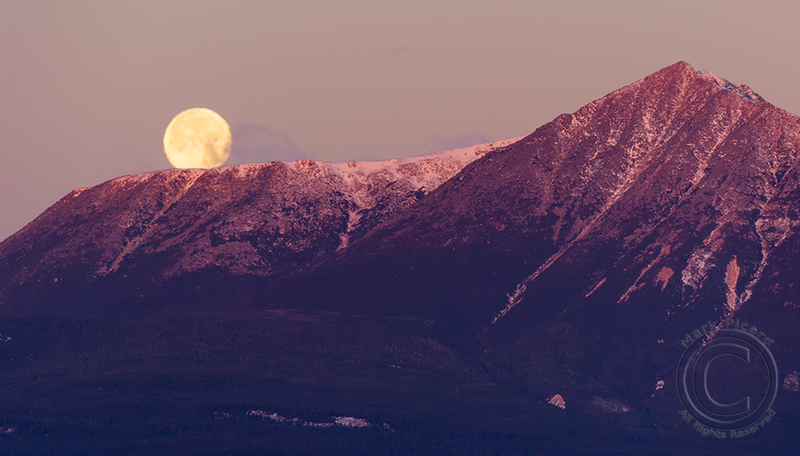 The small challenges of reaching this slightly remote area are offset by the wow factor when observing the shadow of Katahdin and the stars so closely — thanks to astronomer partners who bring all kinds of telescopes, and share expertise for your viewing pleasure for one magical night in the Monument. One more reason to celebrate this amazing gift! For more information on how you can participate and support this and other programs and events at Katahdin Woods and Waters National Monument, explore the pages right here of the Friends of KWW website (https://www.friendsofkww.org). PATTEN, ME: Friends of Katahdin Woods & Waters (FKWW), the nonprofit founded a year ago to raise private funds for Maine’s new national Monument, has completed its second charitable project, the acquisition of a Patten, Maine building to be used for National Park Service administrative offices. FKWW’s first project, funded by membership donations, was an Interpretive Map and Guide to the Loop Road, published in August and available for free. Bossie emphasized the facility is a working office, not a visitor contact venue. Visitor stations are housed at nearby Patten Lumbermen’s Museum and in downtown Millinocket. After retrofitting it, the NPF granted FKWW ownership of the house in 2017. Maintenance funds were also granted to FKWW from an endowment at NPF for the Monument; that endowment was established by The Roxanne Quimby Foundation when the Monument was created in August of 2016. The membership nonprofit was founded in January 2017 by individuals to ensure the success of the newly established Monument. A sixteen-member board of directors guides the nonprofit, which raises funds supporting the Monument, defends it against threats, mobilizes volunteers for site projects and represents users in the betterment of park operations. Like Baxter State Park and Acadia National Park, Katahdin Woods and Waters National Monument sprang entirely from private philanthropy, a word that means “love of mankind generally.” This 87,563-acre gift to the nation and Maine from the Roxanne Quimby family challenges citizens to honor the natural, cultural and economic bounty of the northern wilds. By engaging people in protecting these civic assets, FKWW works, in gratitude, to extend and magnify the tradition of selflessness that informed the Monument’s creation. To become involved in Friends of Katahdin Woods & Waters, visit: www.friendsofkww.org. U.S. Secretary of the Interior Ryan Zinke announces details about the fate of 27 National Monuments under review in a report today. PORTLAND, ME: Friends of Katahdin Woods and Waters (FKWW), the nonprofit organization founded this year to support Maine’s new national monument, expressed concerns over potential changes to the Katahdin Woods and Waters National Monument in a report released by U.S. Secretary of the Interior Ryan Zinke today. Within the report, Secretary Zinke recommends that the administration make changes to Katahdin Woods and Waters that “promote a healthy forest through active timber management” and vague language about prioritizing public access, infrastructure, traditional and tribal use, as well as hunting and fishing rights in the management plan currently under development for the monument. Katahdin Woods and Waters National Monument was designated by President Obama on August 24, 2016 after years of advocacy by locals and conservationists. Maine philanthropist Roxanne Quimby agreed to donate 87,563 acres of land she had purchased for creation of the monument. The current designation allows for fishing throughout the property, with hunting and snowmobiling allowed within certain designated areas. This spring, President Donald Trump called for a review of 27 national monuments, many of which had been designated by former presidents Obama and Clinton. During a public comment period this summer, over 260,000 individuals sent comments to the Department of the Interior in support of Katahdin Woods and Waters; fewer than 100 individuals provided opposing remarks. I’m glad to serve as Vice President of the Friends of Katahdin Woods and Waters because, like you, I want to ensure our Monument is protected and preserved. Our team wants to keep you informed about the latest happenings, so here’s some recent news from in and around the Monument. One-Year Celebration: Katahdin Woods and Waters celebrated its first birthday as a National Monument on August 25, 2017. A number of area businesses gathered to celebrate this momentous achievement at the New England Outdoor Center, and to also raise funds to benefit Friends of Katahdin Woods & Waters (FKWW). Along with meeting visitors and new friends, many of us were filled with pride for the Monument and the community that has come together to create, protect, and share it. We are grateful to everyone who participated by attending, donating funds or beautiful auction items, and joining as new members of FKWW. A special shout out goes to the Maine Beer Company for hosting this business-driven event! Department of Interior Status on Monument: Amidst the anniversary festivities, there was an undercurrent of uncertainty about the unknown, long-awaited decision by the Trump Administration over our National Parks and Monuments. On September 17, 2017, the Washington Post leaked the DOI’s report. At this time, there is little clarity to this report for the Friends of Katahdin Woods & Waters to comment on or process. That said, in accordance with our mission, we will continue to fight to preserve and protect the Monument as outlined in the original proclamation. Friends KWW is Growing: In case you haven’t seen media sources that picked up our September news release, FKWW appointed Andrew Bossie as new Acting Executive Director, along with Elaine Tselikis as Communications and Administrative Coordinator. Andy is now the public spokesperson for the Friends. Feel free to reach out to Andy or Elaine anytime. We are very excited to have such a great team — working alongside our robust and committed Board of Directors — to help build and strengthen operations, membership and mission delivery. Thank You, Lucas: Speaking of a strong Board of Directors, our Board formation has been stewarded by the gifted vision and leadership of Lucas St. Clair. Lucas has faithfully served as Board President prior to and since the formal inception of the Friends of Katahdin Woods & Waters. It is with heartfelt gratitude that we wish Lucas and his family well as he departs his FKWW Board service to start a new chapter in his life. Accomplished environmental leader Cathy Johnson is the new Friends President. Watch your next Update for news from Cathy! Friends Publishes Loop Road Map: Planning to visit the Monument? Email us your mailing address and we will happily send you a free, printed copy of the Interpretive Map for the Loop Road! Your membership donations helped FKWW produce its first charitable project for the Monument: a precision topographic map showing trails, roads, rivers and other loop area features, with interpretive texts and photos keyed to scenic and historic stops. It’s available at the Monument’s Millinocket and PattenVisitor Contact Stations, Patten Lumbermen’s Museum, the Katahdin Area Chamber of Commerce and at many area businesses. Thanks to you for helping make the visitor experience at the Monument a more enriching one, while also protecting and preserving all that is special about the Monument. Autumn is another gorgeous season to experience and photograph its diverse natural beauty and wildlife. Portland, Maine: Friends of Katahdin Woods & Waters (FKWW), the nonprofit organization founded in January to raise private funds for Maine’s new national monument, has appointed Andrew Bossie, of Portland, as FKWW’s first executive director. He began the part-time position on September 1. Bossie was executive director of Maine AIDS Alliance (2007-2011) and ran Maine Citizens for Clean Elections (MCCE) from 2011 to 2017. He grew up in Caribou, Maine, and took his bachelor’s degree in political science at the University of Southern Maine. “The mountains, waters, and woods of Maine’s newest monument have been a place of wonder, relaxation, and recharging for much of my life. It’s an honor to be working with Friends of Katahdin Woods & Waters, Maine communities, and people everywhere to ensure this special tract of land is protected, supported, and enjoyed for generations to come,” said Bossie. Tselikis is principal at VisionTree Creative, in which capacity she has developed grants for numerous Maine organizations. She also has served as Assistant to the President of St. Joseph’s College of Maine, Director of Communications and Outreach at Literacy Volunteers of Maine, and Director of Communications and Development at Lift360. She holds both a bachelor’s in art education and master’s in adult education from the University of Southern Maine. The mission of Friends of Katahdin Woods and Waters is to preserve and protect the outstanding natural beauty, ecological vitality, and distinctive cultural resources of Katahdin Woods and Waters National Monument and surrounding communities for the inspiration and enjoyment of all generations. A sixteen-member board of directors guides the nonprofit, which raises funds supporting the monument, defends it against threats, mobilizes volunteers for site projects and represents users in the betterment of monument operations. Like Baxter State Park and Acadia National Park, Katahdin Woods and Waters National Monument sprang full-blown from private philanthropy, a word that means “love of mankind generally.” This 87,563-acre gift to the nation and Maine from the Roxanne Quimby family challenges citizens to honor and steward the natural and cultural bounty of the northern wilds. By engaging people in protecting these civic assets, Friends of Katahdin Woods & Waters works, in gratitude, to extend and magnify the tradition of selflessness and generosity that informed the monument’s creation. To join and become involved in Friends of Katahdin Woods & Waters, visit: https://www.friendsofkww.org. It’s been a busy year since Katahdin Woods and Waters National Monument was designated. Learn how you are helping us preserve and protect the outstanding ecological vitality, beauty, and all that is special about this irreplaceable Natural wonder. It has been almost a year since Katahdin Woods and Waters National Monument was designated. What a busy year it has been! Our non-profit Friends of Katahdin Woods and Waters group has been established and we have just completed our first project – an Interpretive Map for the Loop Road. Thank you for joining us as a founding member! Loop Road Interpretive Map: Visitors to the Monument can now obtain a free Interpretive Map for the Loop Road. This map describes some of the historical, biological, and geological points of interest along the Monument’s 16 mile loop road and highlights recreation opportunities including hiking, biking and birding. The Interpretive Map is available free at the Monument’s Millinocket and Patten Visitor Contact Stations, at the Katahdin Area Chamber of Commerce, at many businesses in the region, and along the Loop Road. It can also be down-loaded here. Come Celebrate! You and your friends are invited to a party on Friday, August 25, from 5 – 8 pm, at the New England Outdoor Center to celebrate the Monument’s first birthday! See more details and get your tickets here. Bring your friends and join us for an evening of fun, which will benefit the Friends of Katahdin Woods and Waters. You CAN get there from here! Governor LePage has refused to allow the National Park Service to put up signs directing visitors to the Monument. However, people across Maine have put up their own! And people are going. The National Park Service reports that as of early August, 3,500 cars had traveled on one of the Monument’s roads since the roads were re-opened in late May/early June. National Monument Review: On April 26, President Trump signed an Executive Order directing Secretary of the Interior Ryan Zinke to “review” 27 National Monuments, including Katahdin Woods and Waters (KWW). A public comment period followed. Over 99.96% of those who filed comments supported the Monument. Secretary Zinke visited the monument in June and met with many local supporters, including many business owners. The Board of Friends of KWW filed strong comments in opposition to any changes to the Monument. We are anxiously awaiting the Secretary’s decision which is due by August 24. Getting Organized: The Friends of Katahdin Woods and Waters is off to a strong start. Since January, we have: become incorporated, recruited a highly qualified board of 16, received our tax-exempt status determination from the Internal Revenue Service, attracted over 250 founding members, completed our first project for the Monument, and, most recently, contracted with Elaine Tselikis to provide part-time communications and administrative coordination for the organization. Feel free to contact Elaine if you have questions or comments. Volunteer Registry: Many of you have notified us through our website or by email about ways you would like to help. As a result, we have created a database of volunteer supporters. If you are interested in sharing your skills and expertise, please register here. We can then match up interests with action on future projects. As summer winds down and our thoughts turn to autumn, we encourage you to visit the Monument. It is beautiful in every season! Again, thank you very much for being a founding member of Friends of Katahdin Woods and Waters. While there will undoubtedly be challenges ahead, we are optimistic and look forward to contributing together to the success of Katahdin Woods and Waters National Monument. Millinocket, Maine – Friends of Katahdin Woods & Waters, the nonprofit organization founded in January to raise private funds for Maine’s new national monument, has completed its first charitable project, an interpretive map and guide to the scenic Loop Road. Designed by cartographer Bill Duffy of Northern Geomantics, the 18-by-24-inch folded, full-color production has on its front side a precision topographic map showing trails, roads, rivers and other loop area features. An interpretive text and photos keyed to scenic and historic stops occupy the reverse. The Katahdin Woods and Waters National Monument Loop Road Interpretive Map is available free at the Monument’s Millinocket and Patten Visitor Contact Stations, also at Katahdin Area Chamber of Commerce and along the Loop Road. An electronic version can be viewed at https://www.friendsofkww.org/visitkww and on the free-for-download Discover Katahdin visitor’s app. Join Maine Beer Company, Friends of Katahdin Woods and Waters, The Wilderness Society, Patagonia, and the Natural Resources Council of Maine to celebrate the one year anniversary of the Katahdin Woods and Waters National Monument. The evening will include dinner, catered by the New England Outdoor Center and Moe’s BBQ, beer from Maine Beer Company, live music from Jerks of Grass, and a silent auction. Please contact info@mainebeercompany.com with questions about the event. On April 26, 2017, the President issued an Executive Order directing the U.S. Department of the Interior (DOI) to review 27 National Monuments, including Katahdin Woods and Waters. During public comment period, over 99.96% of people who filed comments supported the Katahdin Woods and Waters National Monument. Following a visit to the region by DOI Secretary Ryan Zinke, the Board of Directors of the Friends of Katahdin Woods and Waters sent him the following detailed letter, strongly opposing the review of the Monument, or any attempt to alter its designation.